I always wanted a smoke detector for Nic's Pad. I believe I could get it from Ace Hardware or DIY store, but I just brain freeze or lazy to go & get it. After all, I do not think my Airbnb guest would smoke inside the bedroom or toilet or living room, and I got a balcony for them to smoke with ashtray prepared on the foldable table. 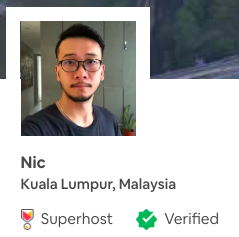 The info & rules are in my Airbnb page. But you know what, better to be safe than sorry. Just install one anyway. So, it seem to be pure luck because I hardly login website nowadays & it is free somemore. I just gotta grab it. And I'm going to tell my friends about it. Yeah, few of them are actually Airbnb host as well. 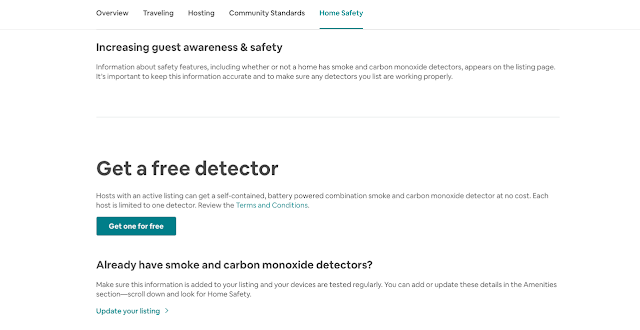 [Below] Click on Learn more button in 'Check or install detector' box. [Below] Click on 'Get one for free' button. 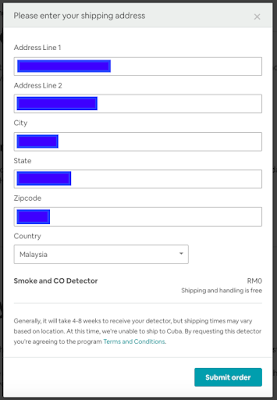 [Below] Then, you fill up the shipping address. Finally, you will get email notification about it. Next, you just have to wait 4-8 weeks (no promise. lol) for your free smoke detector. Cheers. Note: I will update this post when I get my free smoke detector from Airbnb. 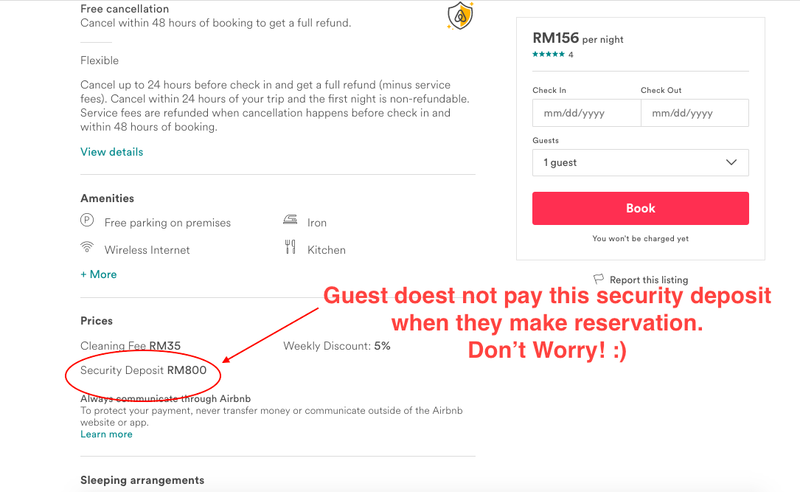 I get a lot of question on this 'security deposit' that is one of the amount display under the Prices tab in Airbnb Listing. As a host, I also learn along the way. So I decided to create this post to remind people or easier for me to just copy paste this link to my Facebook page to educate the newbies. The images below simply answer the question already & also explain What is security deposit to guest, host as well as to Airbnb. Hope you learn something today :) cos I do everyday. Cheers. Here's the explanation from Airbnb site & link as well. My cousin Jessica wanted a short holiday trip during her leaves & asked us if we would like to travel together, and my grandma. It was 1st time for us to travel with my relatives, 2nd time to travel with people. I mean we hardly travel with people, almost every holiday trip is just both of us. Luckily it turned out okay. To my surprise, my grandma was more than well-fit in her age to follow us. Simply amazing! Before the Saigon trip, I was eagerly to get DJI Osmo Mobile so that I can shoot video clips for the trip. Hallelujah! The package delivered to me just in time & I love Osmo Mobile! For your information, DJI Osmo Mobile arrived in Malaysia store somewhere in October 2016. I guess it is getting more popular among Malaysian youngsters by now. I did not practice much with it before the trip, but the video clips turned out great. Highly recommend DJI Osmo Mobile for those would want to use their mobile phone as camera & want a steady shooting for the mobile video. Here's the official website : http://www.dji.com/ but I got it from http://www.march.my/ (Malaysia online store selling DJI products). You can also get it from tech stores in Kuala Lumpur. I've found it in Pavilion (camera shop) and Midvalley. Do compare the price if you want cheaper. - Ben Thanh Market, Bitexco Financial Tower. - Downtown : War Museum & site, Notre-Dame Basilica, City Post Office, City Hall & The Rex Hotel area. - Mekong river, floating fruit market in boat, walking on an island to visit fruit orchards, learning local people make rice paper and crispy rice cake then sampan through small canals by rowing boats before having lunch recommended on an island.